I fished Belton Lake all day today, with guests on board in the afternoon only. Unfortunately, the afternoon’s bite just paled in comparison with the morning feed. I welcomed back Miss Lily L. of Belton, accompanied by Jason B. As we met at dockside there was not a breath of air and I knew it was going to be pretty tough, hoping that we’d at least get a good sunset bite. 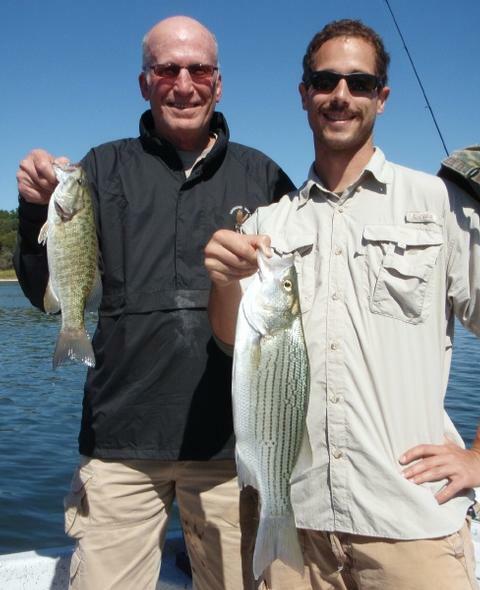 We struggled for the first 2 hours, boating 4 white bass, a blue cat and a keeper largemouth. All but 1 white came on the downriggers off Areas 678, 683, and 474, and the white bass came on a smoked slab off Area 294. As sunset approached, we headed to the vicinity of Area 081 (BA: 5 HG) and finally got a break. Sonar lit up with fish beginning to lift off the bottom and both suspend beneath and pursue after baitfish above. Several times on the barely chopped surface we could see fish break water and shad skip out ahead. We kept downriggers going due to the suspended posture of these fish and Lily’s limited ability to cast effectively. We also put out 2 flatlines given the near-surface action. We boated 8 fish and missed 3 more all in the last 35 minutes of the day. These fish slowly moved shallower up toward Area 024 as the light dimmed. At 5 years old, 7:00pm is pressing close to Lily’s bedtime and so, despite the biting fish, we left a few minutes early than I normally would so mom didn’t have a hard time dealing with a cranky fisher-girl. This was Lily’s 3 trip out with me in a 2-month period and she has really progressed over that span of time. She has excellent technique when a smoking tactic is called for using slab spoons, she understands the working of the downrigging equipment, and she’s overcome her fear of touching and holding fish safely by their lower jaw. 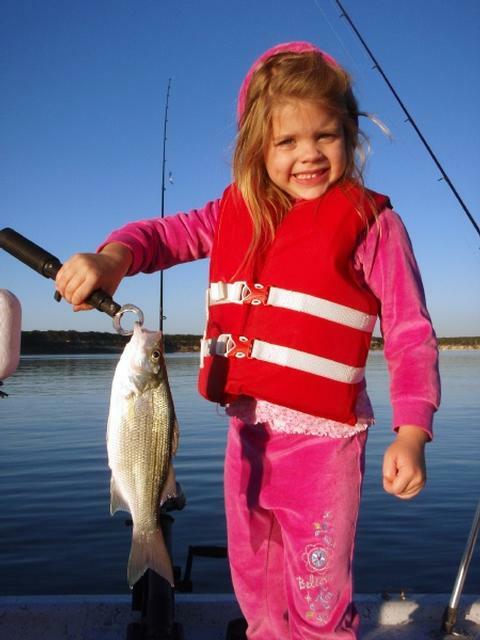 She’s been able to catch sunfish, white bass, blue catfish, hybrid striper, and largemouth bass and is a fast learner. We agreed that with the cold weather coming we’d probably put off any further trips until Spring, but, once she’s turned 6, we’d give casting a try — always something to look forward to. As the sun rose, high pressure was still building in on the heels of a cold front’s passage the day before. As the cool, dry air came in from the NW, the fish fed aggressively. I fished 4 areas, found fish at 3 of them, and, by noon had boated exactly 81 fish with all but a handful being solid, legal white bass, with 2 legal hybrid and 5 short hybrid mixed in. The fishing activity mimicked the wind nearly exactly as it often does on days on and after a front’s passage — the harder the wind was blowing, the better the fish bit…as the wind slowed, so did the bite, and when the wind died, fish were very hard to tempt or even find separated from the deep bottom on sonar. Pre-Sunrise to just Post-Sunrise: Area 147. Only managed 6 fish here despite seeing better sonar returns. Fish were a bit tentative before the sun brightened things up. A smaller 3/8 oz. TNT 180 did the trick on an easing technique combined into a smoking tactic. Early morning: Area 681 to 682 (BA: 5HG, 1T) These fish were the most active I found today. They were thick on bottom, found in fast moving schools at mid-depth, and occasionally were breaking water chasing bait to the surface. A lift-dropped slab was the best approach when they ramped up, and an easing tactic was best as they settled down. A TNT 180 in 3/4oz. did the trick. Boated 49 fish here. Late morning to noon: Area 683 — I hit this area as the winds swung from NW to NE, and as they tapered out to nothing. Although there was little here to indicate the presence of gamefish, abundant bait and the occasional blip on bottom gave some clues. Boated 26 fish here including 1 legal and 4 short hybrid — balance was legal white bass. Air Temp: 43F at trip’s start. Wind: Winds were light from the WNW at 11 at sunrise, slowly dying to calm by 10:15am, then staying calm until a light/variable puff arose just before sunset. Skies: Skies were bright and clear the entire trip. I had a great fishing trip this morning with two young men from Ft. Hood. Austin Bayless is the 8 year old son of Wyatt and Jennifer Bayless. First Lieutenant Bayless is serving at Forward Operating Base Echo for a one year tour with the 3rd Armored Cavalry Regiment in Iraq. 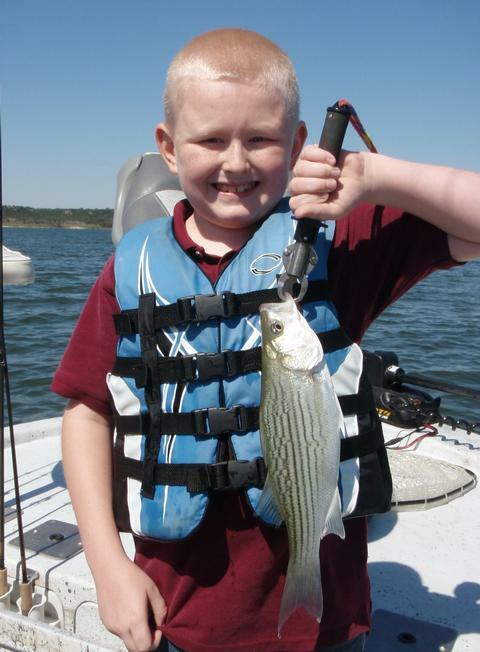 William Moore is the 9 year old son of Ramey and Stephanie Moore, both originally from Paris, TX. Captain Ramey is an armor officer serving with the 4th Brigade of the 1st Cavalry Division in northern Iraq. Both men are on their second tour to Iraq. Their wives know each other through a connection made in homeschooling their children and learned of SKIFF that way. We linked up at 6:45am and despite the darkness and the early hour, the boys were bursting with enthusiasm. William told me he woke up at 3:15am and really couldn’t get back to sleep because “I was thinking about fishing so bad!”. I opted to head to Belton Lake for this trip as it has been giving up great numbers of fish, albeit smallish ones of late. But, when working with 8 and 9 year olds, quantity trumps quality every time, so, to Belton we went. In summary, we caught fish from the moment we let down our slabs for the first time and until we had to reel up at about 11:15 to meet the agreed upon finish time I’d discussed with Mrs. Moore earlier. We started off around Area 473 and used a smoking technique on spinning gear rigged with TNT 180 slab spoons to take a mixed bag of short and keeper white bass, short hybrid, and a few keeper largemouth in 26-31 feet of water. We caught 36 fish here before the bite weakened around 9:30. We then checked out Area 356 and found a few fish on the N. facing breakline from 24 to 32 feet and smoked a few of these before switching over to downriggers just to add some variety to our day. We caught only 9 fish here before moving on, including a nice crappie boated by Austin, all on Pet Spoons. It was at this spot that William got randomly stung on his thumb by a yellow jacket — that took the wind out of his sails for a few minutes, but Austin and I tried to snap him out of it, and, after a while he bounced back. Finally, we fished over 38-40 feet of water directly between Areas 098 and 294 and in less than an hour’s time boated 41 more fish, nearly all of which were solid 13 inch white bass! The timing on this last bit of action was great … the boys were now well-practiced at jigging, and the pre-frontal winds were starting to ramp up from just W of S, thus putting the fish into overdrive. By trip’s end we’d boated exactly 86 fish and the boys just couldn’t wait to tell somebody about their exploits. Q: Who is the best repairman in the ocean? Q: Who is considered the greatest musketeer of the sea? Unfortunately, he had about a million of these zingers and tried every last one of them out on Austin and I!! You just can’t make this kind of stuff up!! Thank you, AFF, for doing all you do behind the scenes to allow for days like this to play out for our military’s kids. I fished an after school “Kids Fish, Too!” trip today with little 5 year old Lily L. of Belton (and big people Sophia and Jason!) Lily came out with me a few weeks ago and so enjoyed the whole experience that she talked mom into going again. 5-year old Lily shown here in “mid-shriek” as Sophia and Jason help her show of a few of the larger white bass she caught “all by herself”. Jason finds “the shriek” humorous, as do I. For variety’s sake, we fished on Belton today (last time we hit Stillhouse). Since a few weeks have gone by, the water has cooled a bit, and the sunfish that made up a sizeable part of her catch last time were not cooperating on Belton today. 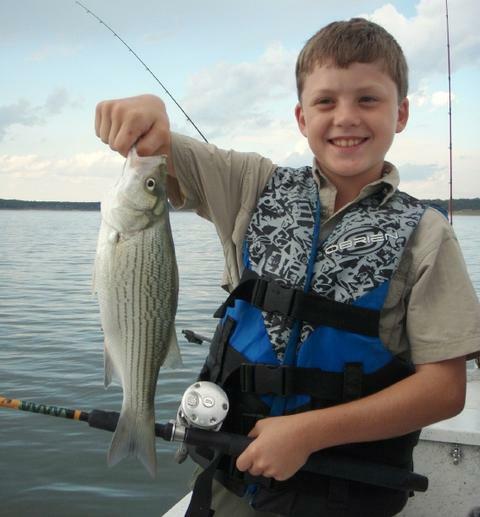 Lately, Belton has been producing good numbers of fish, although most have been smallish. That, however, is not a bad thing when working with kids and/or novices as the small fish provide lots of action to repeatedly practice the fundamentals — on things like retrieve speed, hooksetting, rod posture, etc. Today was no exception … we found ample numbers of white bass and short hybrid at between Areas 474 and 214 first by covering ground with dual downriggers, then, once the fish showed themselves, after boating 5 in a row, we buoyed them and worked them over with smoked slabs. In all, we slabbed up 31 fish in this vicinity. I was really proud of Lily for this accomplishment … she properly held her spinning rod, opened and closed the bail when appropriate based on watching the line slip off the reel’s spool, worked her lure correctly and consistently, and she hooked up again and again thanks to her thorough attention to those basic details. Around 6:25, with the S breeze dying off, some very light topwater action could be seen nearby. I rigged up a Cork Rig and did the casting for Lily, and she took care of imparting the nice, steady retrieve that put 3 white bass in the boat before the action died. With sunset approaching and the shadows growing long, I suggested that we pose for some photos so they’d still be bright and colorful. Well, last time I took Lily out, I noted how she made a quaint “fish shriek” sound anytime a hooked fish got unexpectedly close to her or made a sudden movement when being unhooked. Well, today we discovered that the “fish shriek” is an hereditary trait that was passed down from her mother’s side. Jason and I were quite amused as we had multiple episodes of both “solo shrieking” and “duet shrieking”. Further study will be required to find out if this trait is dominant or recessive. After taking all the photos Lily could sit still for, we headed off for one last stop to downrig from the gut just SE of Area 016 west to Area 147 for a shot at a sunset keeper hybrid for Lily. We no sooner arrived and got the riggers down (Jason was quite proficient by now) than line was screaming off of one of the rods with a hybrid attached to the business end. We boated that one — 17 inches. 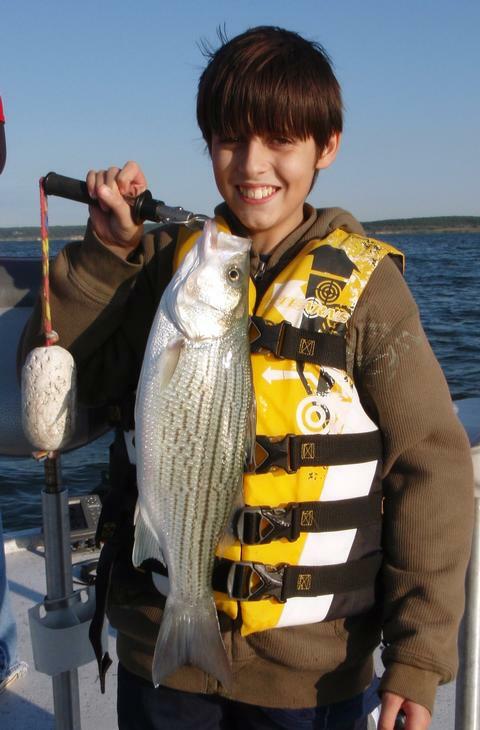 Jason then handed off a small white bass to Lily which struck his lure as he was resetting the downrigger. Then, we got one more strike and converted it to a landed fish — another hybrid going 16″. In all, our tally was 37 fish, most small, but all perfect for a 5 year old little girl who has come down with the fishing bug early in life. Air Temp: 84F at trip’s start. Wind: Winds were light from SSW at 8, tapering to near calm by sunset. Skies: Skies were fair with 30% white cloud cover. Today’s trip was the kind of trip that makes you glad you’ve chosen to be a fishing guide. 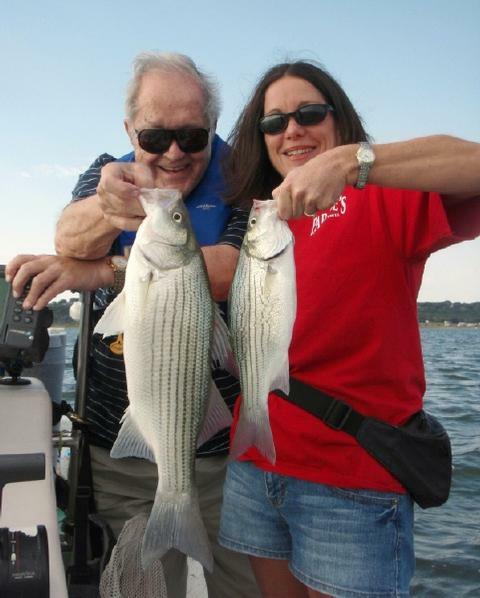 Proud papa Tom and his daughter, Sarah, who caught the first fish of her life on today’s fishing trip on Belton Lake. I had 3 generations aboard today, all super nice people, and the men were focused on the youngster’s success. At 7:30, just as the sun was peeking over the horizon, I greeted Grandpa (Big Lou), his son, Tom, and Tom’s 7 year old daughter, Sarah. We went over a few basics and tried to set Sarah up for some immediate success to grab her interest early. 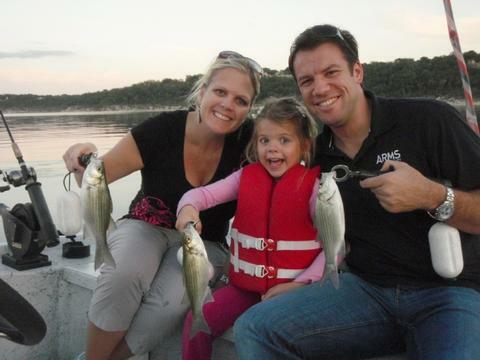 Sarah had never caught a fish before, so, we certainly had to fix that problem! And, about 6 minutes into the trip when her downrigger rod tip jerked erratically, she brought in the first fish of her life, a keeper white bass which struck our Pet Spoon. Now, here’s where the “wiggly jiggly” came in. Each time Sarah had an opportunity to catch a fish, she did really well at it, but, once that fish came in the boat she got a bit timid about going anywhere near it, much less touching it. She stood back what she considered to be a safe distance of about 30 feet (in a 19 foot boat!) and pointed at the fish and, when asked why she was fearful of a small fish, she pointed and said, “Because it’s doing the wiggly-jiggly,” referring to how the fish shook their tails before we removed the hook. Well, in summary, we went on to catch a total of 60 fish today. The fish got active right at sunrise in 30-35 feet of water and in the lower 5 feet of the water column in a section of water bounded by Areas 677, 678, 472, and 473 and were willing to hit a downrigged Pet until around 9:40. We got 21 fish here in all, including short hybrids, short and keeper whites up to 12 inches, and 2 largemouth. Once the low light bite ended, we moved on to Area 214 and stayed on fish here for another solid 2 hours. We boated 37 fish here by smoking slabs including short hybrids, and a mix of short and keeper white bass. Once the slab bite died, we switched over to live bait and, as has been the trend lately given the abundance of small fish, got a lot of bait stolen, but did manage to land an additional keeper white bass and a small blue cat on the shad. After 4 solid hours of gentle, fatherly encouragement, Tom finally managed to convince Sarah that she could touch a fish. We chose the smooth skinned blue cat for this remarkable event. Sarah slowly approached the fish, extended her right arm, then extended her right pointer finger, then touched her pointer finger to the fish for 0.00001 seconds and quickly exclaimed, “There! I touched it!” as she headed back in the direction she came from. And that was that! Back went the fish and everyone was happy. It was just a great trip with great weather, cooperative fish, and a great bunch of folks to enjoy it with. By about 11:20 the morning bite had died off to zero and we called it a great day at that point. Wind: Winds were light from the S at around 5 until ~11:50 when they increased to SSW10. I fished a half-day morning trip today with Tom C. of Salado, and Justin M. of Atlanta who is dating Tom’s daughter and took the opportunity to come to town to meet her family. Tom’s smallmouth and Justin’s hybrid were two of just a few larger fish we took today. Fishing has been very productive, but with a lot of small fish in the take this past week or so. Tom and I hit it off right away as he, too, is a West Point grad, Class of 1965 (yeah, he’s got me beat by 26 years) so we had a lot in common having gone through that shared experience and all that happens once one leaves that “home for boys on the Hudson”. Today, the fish did as the wind did. When we had wind, they hit, and when it went slack, they shut down. We enjoyed a good 2+ hour slab bite from 7:25 to 9:30, taking exactly 70 fish from Areas 473 and 214 over that period of time. 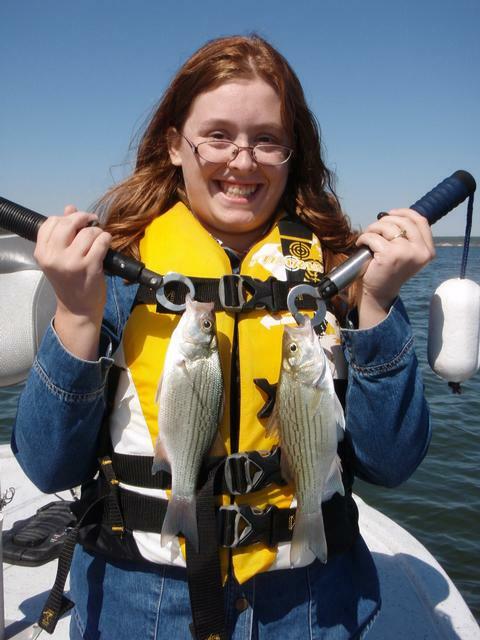 These fish were a mix of white bass (some keepers, most short) and short hybrid. Smallish fish have been the name of the game lately. Neither Tom nor Justin had ever “slabbed” before so, despite the smallish trend on the fish, they got a good education on the details of working a slab for both slow fish and active fish via jigging and smoking, respectively. We were but 10 minutes into the trip and catching fish steadily when it happened … Tom unhooked a short hybrid and accidentally poked the point of the hook on his lure into his left pinky finger. We’ll, to keep his doctor and arteries happy, Tom makes a habit of taking asprin. Long story short … due to his blood being pretty thin, he bloodied up his hand, his pants, the seat he was sitting on, the deck he was standing on, the hand towel I gave him, and a few dozen other things! Justin and I couldn’t that that go by unnoticed, so we gave him grief about being a Viet Nam vet, Long Range Reconnaissance Patrol infantryman, Ranger School instructor, and Silver Star recipient, and losing more blood on a fair weather fishing trip then on the fields of battle!! Around 9:30 the little bit of WSW wind we had completely stopped and the surface got nearly glassy. We had a consensus that we’d roll the dice and forgo additional small fish to hunt a few larger ones. Long story short, we looked all over with sonar and even dropped the slab a few placed, but came up empty. Around 11:45, a puff of wind started out of the NE. I took a look around Area 181 and saw a few suspended fish. I introduced the fellows to the concept and practice of downrigging and we got some baits down among the suspended fish. Tom kicked things off with a just-keeper smallmouth that fell for a Swimmin’ Image, and then Justin popped a nice hybrid (one of only 2 keeper hybrid) on a Pet Spoon shortly afterward. As we moved about, I noted a school of fish on the 35 foot break just NNW of Area 181 getting active enough to perk up at the presence of the downrigger ball going overhead, so I buoyed them. We went back over these fish and smoked them for 10 more fish including a keeper hybrid for Tom. This action coincided with a steadiness in the NE breeze’s velocity at ~4-5 now. We fished these fish until they quit, which conveniently coincided with the arrival of “the girls” to head over to the Dead Fish Grill for lunch, so, we called it a day at that point with 82 fish boated. Air Temp: 48F at trip’s start. Wind: Winds were light from the WSW at around 5 until ~9:30. They then went slack for ~ 2 hours and then a light NE breeze kicked in. I fished a half-day morning trip with Mary L. of Lima, Ohio, accompanied by her son, Jason, of Austin, and her dad, Bob, of Temple. This trip was planned in celebration of Bob’s 89th birthday which fell on this date!! Happy birthday, Bob! Mary traveled in from Lima, OH, and took her dad, Bob, fishing for his 89th birthday. He loved his 4 1/2 pound present!! We intended to get going at 7:15am, but, Mary warned me that 89, sometimes the plan is not what becomes reality, and, in fact, we didn’t get launched until about 7:45, but, as it turned out, as I was waiting, I did a bit of scouting for fish and bait and came upon a nice concentration of both, landed 3 fish in quick succession, put a buoy down at Area 676, and returned to pick up my guests, very confident that were were ready to have a good fishing trip. Once everybody was onboard, we headed out to the marked area, found fish near the buoy, and decided to first shoot for them by way of downrigging. Since Jason was just along for the ride, I handed rods to Mary and Bob and they started feeding out the lines to the proper distance behind the boat. As luck would have it, Bob caught a fish within seconds of having his lure hit the water before we even set the lines down at depth. Once we did get both lines down we caught 1-2 fish on each pass, but as I studied sonar as we slowly moved about, I noticed multiple heavy concentrations of fish along a 25-30 foot breakline here, so heavy, in fact, that I knew we could tease them into striking with a smoking technique using slab spoons. So, down went the slabs (TNT180’s) and up came the fish. Over a 75 minute span spent jigging, we boated 35 fish here at Areas 676 and 677. About 3/4 of the fish were short whites and hybrids and the remainder were solid whites. We didn’t find any keeper hybrid here. By 9:38 these fish were tapering off and so we made a move to Area 346. We encountered only one school of fish here passing through beneath the boat on the move, but managed 6 fish out of the school including a larger, but still short, hybrid as well as the fish that anchored our string today, and, the largest fish that Bob had ever landed in his 89 years — a nice 4.50 pound hybrid striped bass. After this we fished here a bit longer, and came up empty handed. We went and looked at a few areas and found little until motoring over Area 098. I found abundand shad here both suspended and along the bottom, so, we put lines down and came up with a nice blue catfish. By now it was around 11:30 and Mary felt it wise for Bob’s sake to call it a good trip right there, so, we made a special trip over to the waterfall to use it a a backdrop as the trio each held up two of the larger white bass we’d landed. That accomplished, we settled in for the ride back to the dock, safely transferred Bob from boat to dry land and bid one another farewell. Today’s tally was 42 fish. Bob shook my hand before he got back into the car and told me this was the best fishing trip that he’d ever been on. I thanked him for the compliment and we parted ways. I fished a weather-shortened afternoon trip with father and son Paul and Ty S. of Belton this afternoon. Ty with a shad-caught hybrid that took the bait just as the rumble of thunder could be heard to the west. We’d had a very productive morning trip, boating 42 fish, and then, as I scouted around in advance of this evening’s trip, I boated an additional 25 fish, all from right around Area 678. Paul and Ty were able to shake loose a bit early, so we got out on the water around 2:45p. We no sooner got set up to vertical jig at Area 678, then the fellows pulled up a pair of twin blue catfish on their slabs. We continued to fish here until things slowed down and then turned to downrigging from here over to Area 472 and back, accounting for 13 fish in all before we left this area behind as the winds went calm “before the storm”. We now headed out a bit deeper to Area 346. Given the slack wind conditions (typically spelling tough fishing on Belton) I put out 3 downlines with live shad for Ty as Paul continued working a slab. In short order, we boated a keeper white, a fair hybrid, and another blue cat on the shad with nothing coming on the slabs. About this time, the rumbling of thunder we’d heard to the W and SW became a bit more distinct, so, I thought it best we head back toward the boat ramp. I’d planned on staying in the vicinity and fishing, but, things began deteriorating quickly. We tied the boat up to the courtesy dock and I handed Ty a bream pole with which he quickly subdued two green sunfish, and then it happened … big, cold drops of rain began to fall and the wind began to stir from the NW. We headed to our vehicles and spent the next 90 minutes hoping against hope that the skies would clear so we could get on the sunset bite we’d been anticipating, but, it was not to be. We played in safe and settled for the 18 fish we’d boated before the weather turned sour and decided we’d try it again before too long. Skies: Skies clouded quickly from W to E with an approaching storm cell. I fished a morning trip on Stillhouse today with newlyweds Alec and Grace, both of Virginia. Alec has been assigned to Ft. Hood as his first duty station after graduating from VMI and serves with the 1st Cavalry Division. Grace recently joined him here and works as an Army contractor on the post, as well. This trip was a surprise birthday present for Alec. The couple has tried their luck fishing here in Central Texas on a number of occasions, but got “skunked” each time. 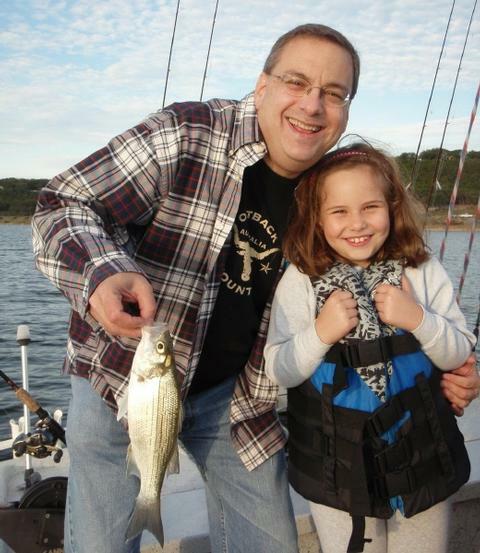 Grace’s mandate to me was “We HAVE to catch ONE fish!”. Newlyweds Alec and Grace with a birthday surprise! 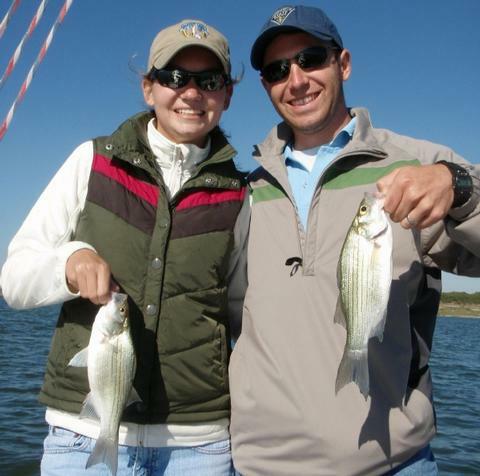 We met dockside at 7:15am and by 7:30am both Alec and Grace had caught white bass on the downriggers over Area 644. We went on to catch two more white bass there as well before the skies brightened and the wind came up sufficient to lead me to take us in search of congregated fish. Unfortunately, the wind just puffed and didn’t really kick in steadily until around 9:30. Until that time the fishing action was soft — we saw 1 short largemouth boated at Area 145, and 5 fish came over the side at Area 252. After that brief flurry of activity, we headed to Area 079 and quickly picked up 7 white bass by “smoking” them with slabs. This action died very suddenly, as sometimes happens when the commotion caused by hooking and reeling in fish stirs up larger predator fish like very large bass or longnose gar. Bottom line: the fishing here ended suddenly and it was time to move on. We unsuccessfully tried a number of locations without finding much in the way of gamefish or bait. We made a final stop at Area 679 and things turned on here really well. The fish rose up off the bottom to meet our slabs on our first drop. In all we boated 17 fish here including 16 white bass and a single 1.25 pound largemouth. By 12:15p the bite was over for good and we headed back in having soundly met Miss Grace’s mandate! Jacob and a “short” hybrid that he was sure exceeded 18 inches! Victoria demonstrated excellent technique in working her slab through a school of white bass to tempt these fellows. We woke to a 54F low temperature this morning with a cool, crisp NE wind blowing at about 9-10. Just before sunrise I met Mrs. Tina VanHook and her two children, 9 year old Jacob and 15 year old Victoria, at Belton Lake. As I’d recommended the night before, all three came dressed in jackets, gloves and knit hats. Husband and father, Chaplain VanHook is currently stationed in Iraq serving with the 3rd Armored Corps (III Corps) until his return in February 2011. Mrs. VanHook learned of the SKIFF program through two other chaplains’ wives whose children have already been out with me. As you might have known based on the wind direction, we were in for a tough trip today. We had a reinforcing cold front come in yesterday. Unlike the previous front which came in on a NW wind, this once came in on a NE wind and the fishing suffered a bit. We began in the vicinity of Area 84/302 with a dual downrigger spread set at 25 feet over a 27-30 foot bottom and saw scattered gamefish with no bait in the area. We boated 3 white bass in our first 25 minutes of effort and once that “sunrise bite” was over, thing got quiet very quickly. There was no bird activity, no surface action, bait was even hard to come by, much less gamefish in pursuit of them. We tried a number of locations in a variety of depths and over a variety of bottom features and found precious little. Around 9:15, we decided to changeup and hit the shallows for some sunfish action in hopes that the winds would shift or that at light a mid- to late-morning bite might kick in a bit later. The kids enjoyed the “hands-on” aspect of sunfishing — they were constantly repositioning their presentation to get near fish-holding cover. At first I pointed good cover out to them, but they quickly got the hang of identifying potential lairs and began to catch fish with some regularity as well as avoid tangles with one another while “competing” for “good spots”!! We found fish at Areas 184, 185, and 673 today. In all we boated a mixed bag of 9 sunfish including bluegill, longears, and green sunfish. Given that it took over an hour to put that together was again indicative of the slow fishing we were dealing with today. Tina’s eldest son required some followup knee surgery later in the day (an Army mom’s job is never done!) so we had a noon deadline to abide by. With about 30 minutes left to go in the trip, the wind began to turn through E and to the ESE. This is the first southerly component we’ve had to the wind in over a week. We got out to Area 672 and sonar began to reveal fish beginning to lift off of bottom into a feeding posture. As we let our slabs down vertically and watched the action on sonar, immediately a school of fish came in on our baits to inspect the commotion. I had the kids “smoke” their baits (a technique we’d practiced earlier) as I teased the fish up off the bottom by slowly reeling in a fish I’d hooked. 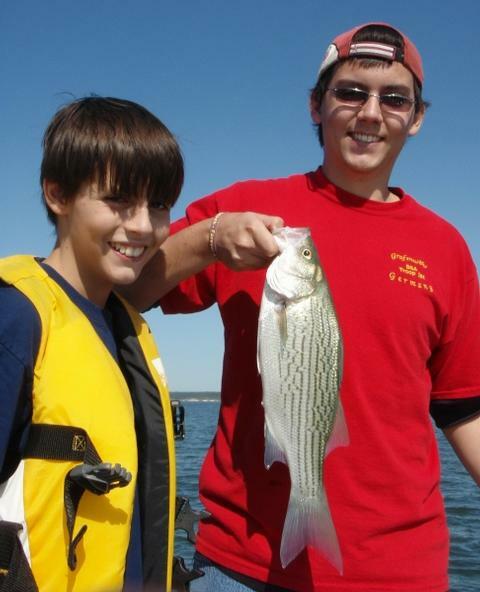 First Victoria hooked up with a white bass, then Jacob hooked up with a short hybrid. We got all 3 fish returned to the water and went looking for more, but this small school had dissipated. As the kids continued jigging I used a lift-drop technique and found fish out awat from the boat which I attempted to draw back in towards us. Jacob connected with one more barely short hybrid and then it was time to head back in. For our efforts today we landed 16 fish. As we wrapped things up, I told the kids of the old fisherman’s rhyme: Winds from the west, fish bite best. Winds from the east, fish bite least. Winds from the south blow the hook in the fish’s mouth. And winds from the north, the fisherman goes not forth. Jacob and Victoria got to see first hand what a difference a slight wind shift can have on the fishing. I was glad the timing worked out well on this trip with the kids able to catch a few more quality fish right at the end and go home with “fresh” good memories. From here on into the winter the name of the game will be “playing” the cold fronts just right. Hopefully we can zig when we’re supposed to zig on the majority of ’em. Joe with a nice Belton Lake hybrid taken from an aggressively feeding school in 37 feet of water on a TNT 180 slab. Johnny with an 11th hour hybrid taken just before the morning feed ended. This fish came out of 44 feet of water. I had a great trip this morning with two really fine young men, 13 year old Joseph Bonar and his older brother, Johnny Bonar Jr., both of Kempner, TX. The boys are the sons of First Sergeant John Bonar Sr. and Mrs. Pamela Bonar. First Sergeant Bonar is serving a one year tour in Iraq with the 75th Ordnance Company. His unit is responsible for explosive ordnance disposal. The day started out just right. Older brother Johnny met me with a firm hand shake and a “Good morning, sir, I’m Johnny,” while little Joe slept in the family truck! As I got to know the boys over the course of the morning, I found that they fished very regularly with their dad from their old family fishing boat, but, since they relied on dad to do the driving and the guiding, their fishing had ground to a halt while he’s away. The fact that the boys had the fundamentals of casting, equipment knowledge, fishing fighting, and the like already under their belts helped make today very productive as we were able to take full advantage of all of the “fishy” situations we worked to find. Today we headed to Belton Lake as it tends to “turn on” in the Fall a bit sooner than Stillhouse Hollow Lake. We were on location a few minutes before sunrise so we took our time idling over some promising areas closely studying sonar for bait and fish. Right at sunrise we found a loose congregation of white bass off a tapering point (Area 147) in about 27 feet of water. We put twin downriggers down with Pet Spoons trailing to see if the fish were in a biting mood. We picked up 4 fish on 2 consecutive passes — they were biting!! I circled back on top of these fish and all three of us then put jigging spoons (TNT 180’s) down and began working these lures as I hovered us in one place so we could study our lures and how fish reacted to them on sonar. Soon, things began to happen as fish not only began to creep in along the bottom to check out the commotion, they began to get excited and chase our baits upwards. 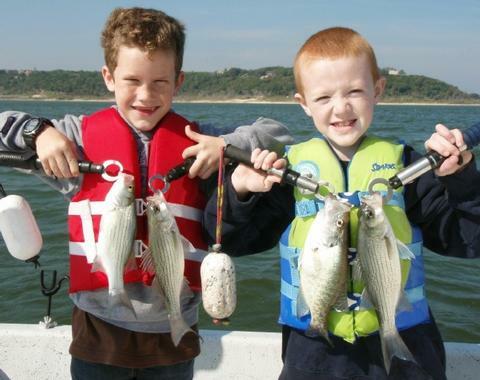 By the time the action here ended about 35 minutes later, we’d boated a total of 15 white bass, all of legal size. Next, we moved on to Area 086 (BA: 4HG), a deep, gentle hump in 37-38 feet of water. As we motored around, sonar and Structure Scan both lit up with fish in the lower 1/3 of the water column with gamefish and bait. I got us over the “center of mass” of this action and we no sooner got our lines in the water than the boys were fast to hybrid striped bass that went for their 3/4 oz. slabs. In scenarios like this where the fish are so aggressive they actually rise up off bottom to meet your lure, it seems the largest, fastest fish are the first ones caught, and, in this situation, we boated 3 of our largest fish of the day right off the bat. While the boys caught fish on nearly every drop, I baited up two livebait rods with circle hooks and just let them work their magic in the back of the boat as the boys kept busy on the front casting deck. I baited with both large shiners and with black saltys, and the shiners seemed to have an edge on the gamefish, whereas the saltys kept attracting small blue cat that would essentially scale the baits, eat the tail, and never grab onto the hook. By the time the action waned here, around 10am, we’d boated an additional 33 fish, now putting our tally at 48. With the skies brightening and the nice NNW slacking off, I told the boys we’d probably only get another hour, if that, out of the fish, and that that hour’s action would likely be slower than we’d experienced up to this point. We made one last stop at Area 672 and fished the “spot on the spot” with some timber and bottom irregularity in conjunction with the large breakline here. We initially used downriggers to probe the area, boating two white bass, then hovered over the fish we found while downrigging and worked them over thoroughly with jigging spoons. This time, most all fish were caught with a standard jigging stroke, and only once in a while would the fish perk up enough to chase. Even when they did chase, the excitement was short-lived. We rounded out the trip with an additional 20 fish here including a mix of short hybrids and whites, a single largemouth and a single drum. By 11:30, the skies were clear and bright and the wind had faded to just a light breeze. The fish got mighty quiet and tough to catch, so, we knew we’d seen the best of it and decided to call it a day. Our tally for this trip was 68 fish, all caught and released. When I see young fellows like this who are clean cut, respectful, sharp, and concerned for family and one another, it gives me hope for America’s future. Thank you, as always, for partnering to make days like this happen for kids like these!